Haemophilus influenzae, Streptococcus pneumoniae and others – acute sinusitis, recurrent acute sinusitis and exacerbation of chronic sinusitis. The duration of treating sinus infection depends on the form and severity of the disease. In acute sinusitis, antibacterial therapy is most often carried out within 7-10 days, but in exacerbation of chronic sinusitis – up to 21 days. Social indications, suspected complications and other factors can become a reason for hospitalization. Antibiotics kill or prevent the growth of bacteria that cause some sinus infections. The number of days you take antibiotics depends on your general health, how serious your sinusitis is, and the type of antibiotic you are taking. A different antibiotic may be needed if your condition does not begin to improve within 3 to 5 days. Other medicines, such as decongestants, inhaled corticosteroids, and medicines that help thin the mucus (mucolytics), may be prescribed as well to improve sinus drainage. The choice of antibiotic often depends on which antibiotics have worked well for you in the past. If an antibiotic normally used to treat your sinusitis was successful in the past, it may be used again. If it did not work very well, a different antibiotic may be tried. 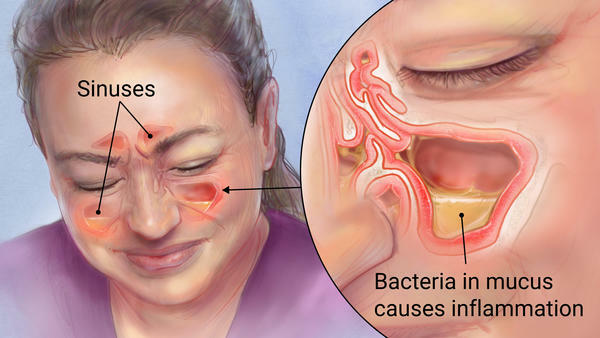 Antibiotics may be needed when symptoms of sinusitis do not respond to home treatment, symptoms are severe, or complications (such as pus forming in sinus cavities) develop. Amoxicillin is often the first choice in treating sinusitis because it is usually effective and has few side effects. It should not be used if you are allergic to amoxicillin or have been diagnosed with mononucleosis. Trimethoprim-sulfamethoxazole may be prescribed for people who are allergic to amoxicillin. Other antibiotics may be prescribed to treat bacterial infections that are resistant to amoxicillin and trimethoprim-sulfamethoxazole. Antibiotic treatment of sinusitis is generally safe and very effective. Most people recover completely when they are treated with antibiotics. It is important to take all of the medicine your doctor prescribes. Keep taking it even after you begin to feel better. This is especially important when treating sinusitis because the antibiotics do not easily penetrate the mucus inside the sinuses. Your doctor will try to select an antibiotic that is most likely to kill the bacteria causing your sinusitis. If the antibiotic fails to cure your sinusitis, another may be tried. If your condition does not improve, further testing may be needed to find which antibiotic will work best for you.